Scarier Monsters And Super-Creepy Doctor/Companion Relationships In New Who? I love you amy do you still love me? The new Doctor Who will see familiar monsters be scarier than even before, according to new showrunner Steven Moffat, and that's not even describing the new Doctor/companion relationship... Mild spoilers ahead. Those scary statues, I should warn you - and your children - are on their way back and they're way way worse this time. There is an episode in this series that I showed to my 10-year-old son and he said there is one scene that is the scariest thing that has ever happened in Doctor Who. There is another episode that will make you gasp, then want to press rewind so you can see it all again. You take two attractive people and they will probably be a bit romantic about each other... It is a complex story between Amy and the Doctor - it is not simple. 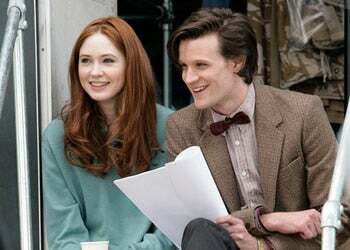 It is not a story you have ever seen between the companion and the Doctor before. We're calling it: the Doctor will fall in unrequited love for Amy. Surely that's the only Doctor/companion relationship we've not seen by now...?